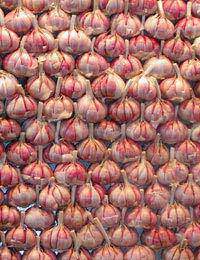 Home > Respiratory Supplements > Is Garlic Good for Respiratory Ailments? Most creatures, with the exception of vampires, can benefit from using garlic. Not only does it taste great when cooked in a variety of foods, it also works as an effective home remedy to treat problems ranging from respiratory tract infections to clogged ears. Allicin sativin, a compound found in the humble garlic clove, has a host of antibacterial, antifungal and antibacterial properties. Research has shown that it works in reducing the severity of respiratory tract infections, and may also help us ward off other ailments such as the common cold and even lower blood pressure. Many people swear that garlic supplements are a cure-all for many problems, ranging from sore throats to coughs to even erectile dysfunction (impotence). It has also been reported to help keep the heart healthy and maintain normal levels of healthy cholesterol. That's why people have used garlic for centuries, either mixing it in foods, eating it raw or, more recently, taking nutritional supplements that are filled with concentrated garlic. While garlic has traditionally been known as an important culinary ingredient or a folk medicine, recently studies have been conducted to determine its actual health benefits. Studies concerning its ability to fight cancer, particularly prostate cancer, are promising, as are those to lower blood pressure. However, most studies so far have been conducted only on animals. Garlic that is pressed into powder or oil form seems to yield the best results. Garlic is occasionally shunned due to its potent odour, which can result in very potent breath. Today many health food stores sell garlic nutritional supplements, including capsules and pills, that are virtually odour-free. However, some say that allicin without that sulphurous odour may be less effective, or not effective at all. When used to boost the immune system, garlic is sometimes mixed with other supplements such as echinacea. Even then, always check the label to see the level of allicin contained therein. And don't confuse allicin with alliin, which isn't the same thing. Aged garlic extract, which does not produce a smell, also has potential health benefits. It contains garlic that has been soaked in alcohol for at least two years. While it is tolerated better by people who are sensitive to garlic, it probably is less effective. Never store raw garlic in oil at room temperature on your own because of the risk of botulism, which can be very dangerous. 1 If you have a respiratory infection, brew a pot of aromatic garlic tea instead of stocking up on antibiotics. Chop up a garlic clove into tiny pieces, then add to boiling water. Allow to steep for several minutes to allow the allicin to fully infuse the brew. When you drink this tasty treat, you'll immediately notice a soothing effect on your throat, and your cough should quiet down. 2 Garlic capsule supplements are another fantastic way to tame a respiratory infection. Available at most health food stores and pharmacies, they are easily swallowed. Best of all, they won't give you garlic breath. 3 Winter is a good time to start adding loads of garlic into the food you eat to ward off infection. If you're stumped about what foods to prepare, buy an Italian cookbook. Recipes there will make your mouth water – and help build up your immune system at the same time. 4 If you are feeling run down or need to be at your best for a wedding, new job or holiday, start eating raw garlic. Aim for one entire clove per day. If it's finely chopped it should go nicely with a variety of foods. Buy a garlic press to mince it out. 5 Eating an excess of raw garlic is thought to ward off mosquitoes as it makes your blood taste unappetising! Unfortunately, it may also ward off your friends and family members. Breastfeeding and pregnant women should not take garlic supplements. Be aware that drug interactions, including with herbals remedies, are possible, and that supplements may increase the risk of bleeding. Garlic supplements can interfere with medication taken to control HIV/AIDS. Too much garlic can cause digestive problems, so don't overdo it. Always ask your doctor for advice before taking any nutritional supplements.